Securely mount a quick release plate for a handle and accessories on top of your Canon C200 camera with this Sliding Top Plate Core from Bright Tangerine. 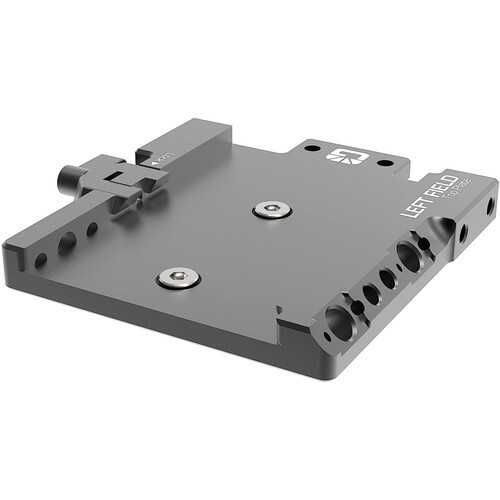 The top plate core is compatible with ARRI standard dovetail plates; a separately available dovetail plate locks into place with a locking lever and allows sliding for balance, which is especially important when mounted on a gimbal or shoulder rig. The top plate core features multiple 1/4"-20 threads for mounting, and it mounts onto the top of your camera. The side threads can be used to mount accessories or side plates to create a full cage. The front threads can be used to connect to the Left Field 15mm Rod Bracket to add 15mm LWS rods to the camera top.